Jaywalking may be against the law in Washington state, but the United States as a whole has a pretty relaxed view on crossing the street against or without a signal. This is especially true in Seattle, where hundreds of thousands of pedestrians take to the streets every day to get to and from work. We've all been there: standing on the sidewalk with a big red STOP signal staring you back in the face, even though there are no vehicles in sight and plenty of time to cross. After all, why waste 10-15 seconds standing on the corner when you could be making progress toward your destination? Lightheartedness aside, jaywalking among pedestrians is a real safety issue. But it also could play a pivotal role in the event of a serious pedestrian accident, especially if the injured pedestrian wishes to pursue a personal injury claim against the driver of the vehicle which hit and injured them. Washington state is one of many states that recognizes comparative fault - also called comparative negligence - when it comes to personal injury claims. This means that more than one party - including the injured party, in some cases - can be held legally responsible for causing personal injury to a person. Let us consider a hypothetical situation in which a pedestrian is hit by a car while the pedestrian was jaywalking. Because Washington state law permits injured people to pursue a civil claim or lawsuit against the person who injured them, this pedestrian may decide to file a claim against the other driver's insurance company. But since jaywalking is unlawful, the legal argument could be made that the pedestrian's own negligence - in this case, the act of jaywalking - was at least a contributing factor to the accident. Insurance companies in these situations will actually likely argue that the pedestrian's negligent actions are the sole cause of the accident, placing the blame on the injured pedestrian. This places a burden on the pedestrian and/or their attorney to prove otherwise. Does Jaywalking Ruin Chances Of A Recovery? Just because a pedestrian was jaywalking at the time of the accident does not necessarily mean that they do not have a valid personal injury case against the driver who hit them. It simply means that there is a chance the pedestrian may have to accept a percentage of the liability for the case, which could impact their overall financial recovery. In Washington, comparative fault means that the total fault may be split between multiple parties involved in the case. For example, a jury may decide to assign a certain percentage of fault to a pedestrian for jaywalking, and assign the remaining percentage to the driver and/or any other parties in the case. Hypothetically, if a jury were to decide that a jaywalking pedestrian was 25 percent liable for their injuries, then the total recoverable damages - the amount awarded by the jury - would be reduced by 25 percent. Since many pedestrian accident cases are settled or otherwise resolved ahead of a jury trial, the insurance companies will try to estimate their own comparative fault percentages and base settlement discussions off of those estimates. However, insurance companies are known for low-balling injured claimants and attempting to minimize their own financial commitments, so do not be surprised if the insurance company does not make a fair settlement offer in this situation. Our award-winning team of personal injury lawyers has a successful track record of handling serious pedestrian accident cases, and are well-versed in liability issues and disputing comparative fault assertions made by the insurance companies. Call our office in Seattle at (206) 727-4000 or use the confidential contact form on this page to have your case personally reviewed by the award-winning legal team at Davis Law Group. Hooray! Seattle has finally shed its small town mentality and become an actual city! 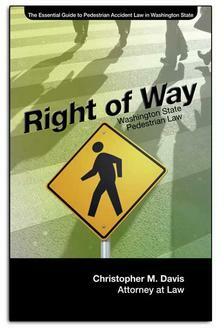 No, jaywalking won't cause an increase in pedestrian injuries especially as people become savvy at doing it safely.